Today I pause from my 'blogcation.' I can breathe a sigh of relief and I give all the glory to God for His goodness and His loving kindness. Life was certain to let me know that whatever plans that we make, we must count them as temporary, because no one knows what life truly holds for him/her. As I reflect on the week past, I recall too vividly my journeying moments in the valley of sickness. I remember the pain that rocked my body, the weakness in my limbs, the sadness and the feeling of loneliness and helplessness. Hope became my only companion and showed me that the only way out was God and that hope itself was all that I could hold on to. Getting sick while on my vacation was not cool at all, but that is exactly what I encountered. It is indeed good to place our trust and our hope in God. When we do, our experiences become easier and there is less frustration when we encounter sickness and even disappointments. Without that kind of hope and level of trust, our experiences are made difficult, miserable and even unbearable when reality sets in that life does not always measure up to meet our expectations, plans and our agenda. Life makes no promise to us. So in spite of me not getting to do all that I had planned to do on the first full week of my vacation, I am encouraged to press on with hope holding my hands. Such hope do not make me ashamed. You too can cling to her and make her your best friend and confidant. 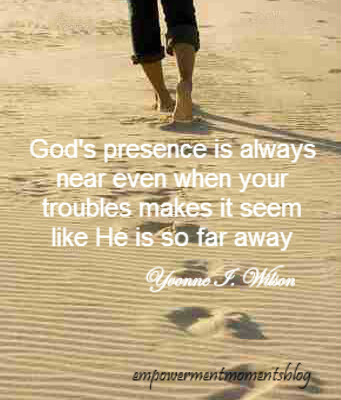 Whatever the circumstance that you may be faced with today, rejoice and hope in God whose presence is always near, even when troubles makes it seem like He is so far away. Until next time, I bid you peace and blessings from my beautiful Caribbean twin island homeland of St. Kitts and Nevis.